Panasonic is celebrating Great Britain's army of Olympic 'Superfans' in its Rio 2016 campaign - the first major social push for the brand - which launched today. The brand is calling on UK sports lovers to show their support for the nation’s athletes on social media by sharing "fun and passionate, wild and wacky" photos with the hashtag #superfans. Tagged posts will be collated at the Superfans website. Team GB had its most successful Olympics for more than 100 years in 2012, finishing third in the medal table with 65 medals, including 29 golds. The overwhelming fan enthusiasm seen around the UK was credited by many with a significant role in spurring the athletes on to victory. "London 2012 was really the first social media Olympic and Paralympic Games, and the digital world has advanced so much since then," said Panasonic UK’s head of brand communications Gaele Lalahy. "The Olympics unites people around the world like no other sporting event can, and we are excited about capturing the Olympic spirit and championing Britain’s Olympic fandom through this campaign." 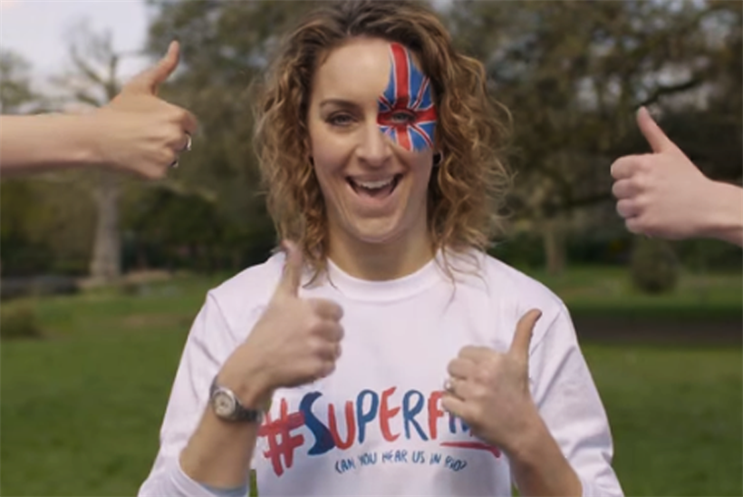 Amy Williams, who won gold in the skeleton at the 2010 Winter Olympics in Vancouver - Team GB’s only medal that year - has signed up as ambassador for the campaign. "London 2012 was undoubtedly an Olympic Games to remember, with incredible sporting achievements backed by amazing fan support across the UK, so the pressure is on to maintain that support for Rio 2016, " said Williams. "I'm so proud of being the Superfans ambassador for Panasonic’s campaign, because fan support really does make a difference for athletes." For the first time this year, Panasonic, which has been an Olympic partner for 25 years, will also be an Official Ceremony Partner - providing visual technologies for the ceremonies of both the Olympic and Paralympic Games. Panasonic will have its own ‘home Olympics’ in four years time, when the Summer Games head to Tokyo. The business has previously said that those Games would provide an opportunity for it to move away from its reliance on the competitive consumer electronics sector - suggesting it could invest in high-tech developments like robot porters and wearable translation devices.